A Pamiri sitting high above the village of Zong. The mountains in the background are Afghanistan. As I walked around Murghab, I managed to negotiate a ride along the Pank River (the Tajik/Afghan border) all the way to Khorog, via the towns of Langar and Ishkashim. I was told this three day odyssey would cost only $100 - a steal for the Pamir. In May 2017, Eshkashim successfully pushed back a Taliban offensive. Today, the Taliban are only 40-50 kms away [note: when I was in Afghanistan, I learned they were as close as 6 kilometers away]. And it's fighting season. Who knows what the situation is like on the ground? What I do know is that tourism in Eshkashim is BOOMING. And what a bizarre tale that is. If I can ascertain that its a story worth telling, perhaps I will take the plunge. If so, I must not gloat - crossing into Afghanistan's safest region is hardly the act of an heroic war correspondent. Things, as always, are worth keeping in perspective. The road to Zugvand seemed extraterrestrial. It was about 300 kilometers from Murghab, but it felt like a road to another planet. There are a handful of green shoots in the farms near Murghab, but once you leave this tiny community, signs of life become rare. The brittle tarmac passes through sprawling valleys at 3500 meters. It was ice cold, but the sign was brutal. Several bike riders pushed hard through the headwinds towards the town of Khorog, Badakshan’s major settlement. But fewer were on the dirt track to Langar, which we soon diverted towards. Alibek was my driver. An enthusiastic engaged 23 year old with no English, Alibek enjoyed showing me the signs along the way. Shortly before turning off onto the road to Langar, we ate a small roadside restaurant in the village of Alichur. We couldn’t really speak, Alibek and I. But we did bond over a bowl of boiled lamb and potatoes, flavoured with fat, onions and dill. In the cold, it was a heart-warming meal. The Pamir Highway between Murghab and Khorog is a mainly sealed road. But the detour to Langar necessitates a sturdy 4WD. Alibek’s driving was slow and cautious - he concentrated firmly as the road deteriorated and became steeper. After an hour or so, he made a sudden stop. Camouflaged in the nearby hillside was a mud hut, out of which an ailing old man and his wife limped. Alibek gave them both kisses on the cheek, and brought them some basic supplies - bread, potatoes, and other hessian sacks of goods common in the region. Being hundreds of kilometers from the nearest store, this isolated couple relied on their network to keep them fed. In exchange, Alibek returned with a cold bottle of fermented yak’s milk - a delicacy throughout the Pamir. It is carbonated like soda water, but with a profound sourness that makes your eyes water. Over the next few hours, Alibek would drink two liters of the stuff. We wound onwards. Soon, Alibek proclaimed: Eddie! Eddie!…Afghanistan! 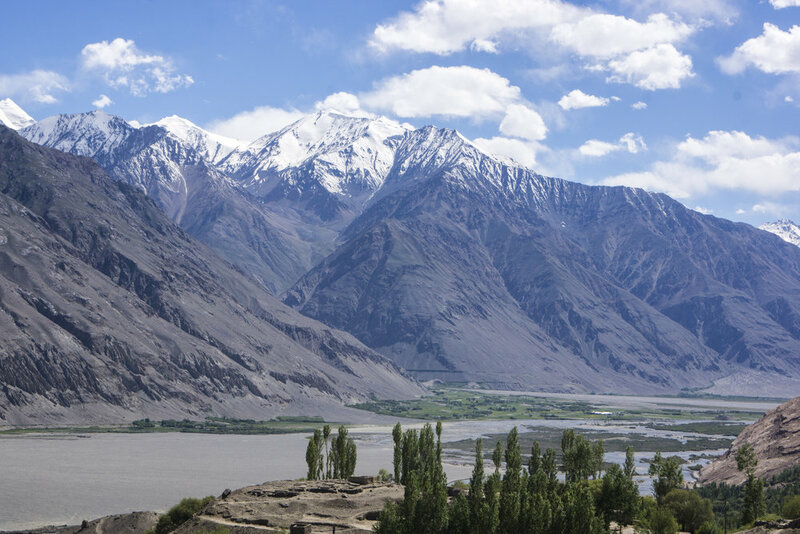 In the distance, the Pamir River emerged, and on its other bank were the undulating hillsides of that section of the Afghan Wakhan. The road to Zugvand: a breathtaking, hours long dirt trail that zig zags across windy steep mountainsides. Zugvand, my home for a few days.